Research shows people who cook more have healthier eating patterns, spend less money on take away foods and have indicators of better health. A study in 160 adults examined whether eating healthy foods prepared at home affects your emotions. Researchers found people who cooked more reported more intense positive feelings and worried less compared to those who had more meals away from home. They were also more likely to then choose healthier foods at their next meal compared to people who ate more food away from home. A recent randomised controlled trial in 141 Irish mothers found learning to cook lasagna, either by following recipe cards or by video increased their confidence and enjoyment of cooking. Being taught how to cook reduced how difficult they perceived cooking the meal from scratch to be and increased their intention to cook it again. It is not only cooking, but sharing meals with others, that is associated with greater feelings of happiness as found in an eight-year follow-up of 39,000 people in a cohort from Thailand. In the US Cooking Matters six-week program, low income adults were taught how to shop for and prepare healthy meals within a tight budget using hands-on meal preparation techniques. Six months after the program was completed individuals still showed significant improvements in confidence about being able to maximise their food dollars and food management techniques associated with choosing healthy foods. They were also less worried about running out of food before they had money to buy more. A survey of 437 adults in the US looked at the relationship between frequency of home-cooked dinners or eating out with overall diet quality and money spent on food. As you could guess, cooking at home more frequently was associated with higher diet quality and spending less per person on food away-from-home ($65 per person per month) and on food overall ($273 per person per month), while eating out more often was associated with lower diet quality and spending more per person on take-away ($133 per person per month) and food overall ($330 per person per month). Importantly the frequent and infrequent home cookers spent about the same on food prepared at-home ($193 compared to $196). Ultra-processed foods tend to be higher in total kilojoules, salt, sugar and saturated fat. In a 2008 survey of 509 adults in the UK, the average percentage of energy from ultra-processed foods was 51%. Those who were more confident with cooking or who cooked a main meal at least five days a week consumed 3–4% less total daily energy from ultra-processed foods. This is equivalent to a difference of around 240–330 fewer kilojoules per day (57-75 Calories) coming from ultra-processed foods. It may not sound like much, but over a week it makes a difference to your intake of nutrients such as fibre, vitamins and minerals. For example 2,300 kilojoules is equivalent to about a 100g bar of chocolate or 2kg of broccoli. In a US study, over 58,000 women and 41,000 men were followed for 25 years. Every four years they were asked how many of their lunch and dinner meals were usually prepared at home. Among those having five to seven home prepared evening meals there was a 15% lower risk of developing type 2 diabetes compared to those having two or less, while among those who had five to seven midday meals at home there was a 9% lower risk. This higher risk was partly attributed to those eating more meals at home experiencing significantly less weight gain. For those consuming 11–14 meals per week prepared at home, women gained 3.02kg and men gained 2.62kg during follow-up. This was significantly less than the weight gained by those having zero to six meals a week prepared at home, which was 3.36kg for women and 3.85kg for men. In studies where people actively sought to cook more they improved nutrient intakes, diversity of food groups, and ate better foods. Across all the studies of this type there were some positive impacts on health outcomes such as blood cholesterol, blood pressure, markers of rheumatoid arthritis, chronic kidney disease and quality of life for patients with prostate cancer. The reviewers highlighted though that well-designed studies with rigorous evaluations were needed because many studies had weak study designs. Who teaches you to cook? A 2015 survey found about one in five Australians wanted to cook more at home. 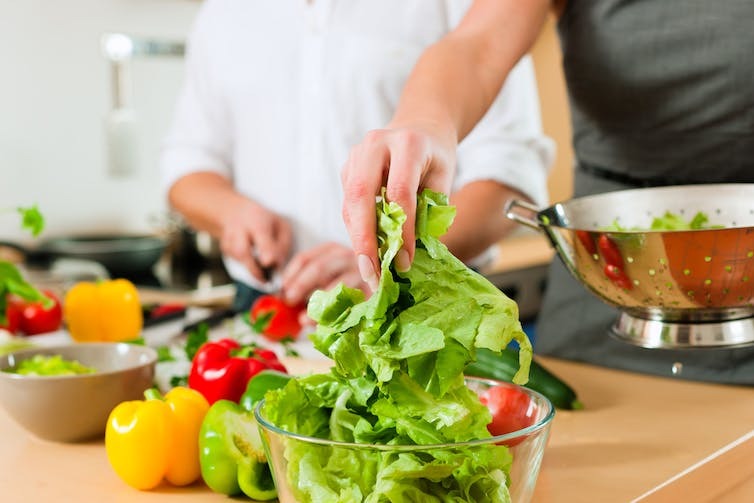 In an Irish survey, over 1,000 adults were asked about their cooking skills, including cooking measures such as chopping, food skills like budgeting, cooking practices including food safety, cooking attitudes, diet quality and health. They were also asked when they learnt to cook and who taught them. Results showed adults who had learnt to cook as children or teenagers were significantly more confident, had a greater number of cooking skills and practices and mostly had better overall diet quality and health. Mothers had been the main person who taught them how to cook. Learning to cook from an early age is important. This means the health of the whole family could potentially be improved by helping the main carers to improve their cooking skills. At the University of Newcastle we’re conducting a nation-wide online survey that will compare the cooking and food preparation skills of Australians with people from European countries. You can take our survey by clicking here.